The Return of The Question? I know. I haven’t been blogging about comics in a while. There’s a couple of reasons for that. The first is that my regular crime readers aren’t that interested in comics. That’s cool. No worries there. The other is that because of my real-world responsibilities I no longer have the time. While I do some comics stuff over at my G+ page, for the most part, I’ve been reduced to a weekend blogger and comics was the first subject to get cut. However, something happened this week that filled my geek heart with glee but then a sense of dread and it happened in Justice League #0. Not only did this issue finally have Billy Batson finally get the powers of Shazam but it marked the return of my favorite comic book character of all time. It’s the character that inspired my original internet pseudonym of TheTrenchcoat. I am of course referring to the fedora and trench coat wearing and no face having The Question. While I’m happy to see his return the lack of elaboration in the issue has me worried a little bit. 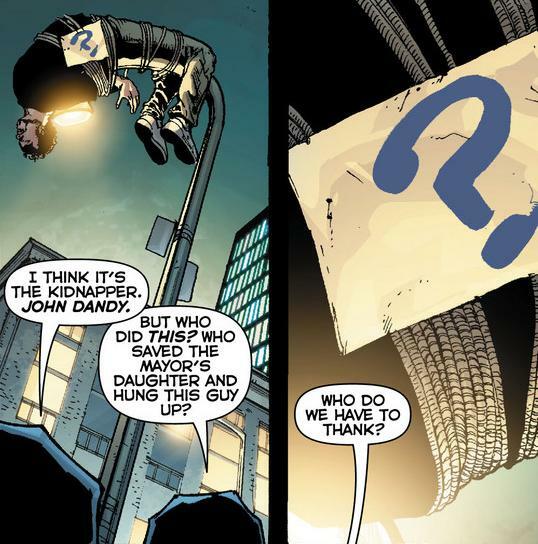 In the New 52, The Question was one of the Trinity of Sin along with the Phantom Stranger and Pandora. It hasn’t been made clear what his sin was but he was punished by the Council of Wizards to be always questioning his identity and they removed his face. Yes, you read that right, wizards. Our intrepid faceless crime fighter may have magical powers although I hope he doesn’t. I was really hoping for a return to his original objectivist ways as was intended by his creator Steve Ditko. I would have even been happy with his 1980s zen outlook from the Denny O’Neil run on his comic. There is a glimmer of hope though. In this incarnation, it was briefly alluded to that he may be written as his Justice League Unlimited animated counterpart. The conspiracy-minded detective who can see commonalities that even the great Batman can’t. Will his character be a New 52 success or will it be just another failed reboot? That my friends is the question.